BAJA !! The Spanish word for “lower”, (as in Baja California, Mexico), is used with familiarity to identify that rugged and often misunderstood finger of desert and mountains poking a thousand miles south of the U.S. border into the abundant waters of the Pacific Ocean and the Sea of Cortez. Baja means Adventure! !, Long deserted beaches, awesomely beautiful scenery, and escape from the awning-to-awning RV parks to which so many travelers seem inescapably tied to by an artificial umbilical cord. 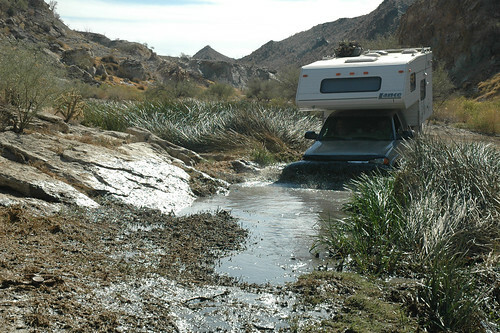 One can only wonder why we have four-wheel drive campers?! The reason is places like Baja. 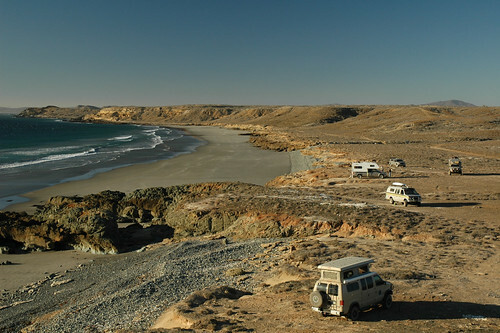 Baja has a young, beautiful and vivacious mistress; The Sea of Cortez. Standing waist-deep in her warm amber waters at sunrise, fishing pole or first cup of coffee in hand, one could not wish for a more accommodating hostess. About five million years ago, a slow tectonic slide forced ragged peaks out of the Pacific as the Baja peninsula divorced itself from the Mexican mainland. Schizophrenic to say the least, the land can be so harsh and barren, only lizards and snakes hope to survive, but cross a ridge and drop into the next arroyo, and life is in such a chaotic celebration, it defies our concept of desert. 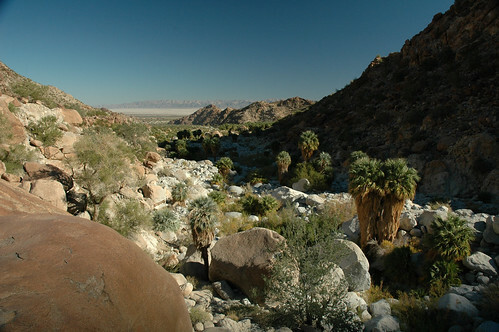 Dry, desolate, rugged and inhospitable; in most cases even inaccessible; a land of rock and cacti slashed by wide arroyos of soft sand purged by periodic flash floods rushing down from distant canyons. This is Baja California. But there is a lighter side. 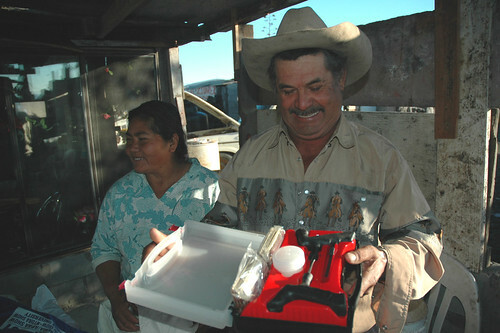 This crotchety old man called Baja has a young, beautiful and vivacious mistress; The Sea of Cortez. Standing waist-deep in her warm amber waters at sunrise, fishing pole or first cup of coffee in hand, one could not wish for a more accommodating hostess. Her graceful arms of white sand arch along the coast, embracing bay after deserted bay. 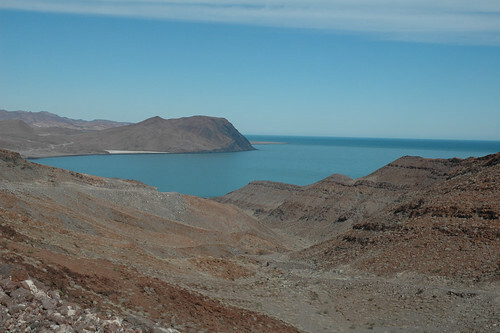 Once called the Vermilion Sea and later the Gulf of California, the Sea of Cortez is the youngest of the world’s deep-water gulfs, with a depth of nearly two miles at its mouth where the Pacific Ocean pours in. Though the once prolific fishing has been tainted by commercial operations, the Sea of Cortez is still one of the biggest “fish traps” on the planet; World-Class angling by any standard. 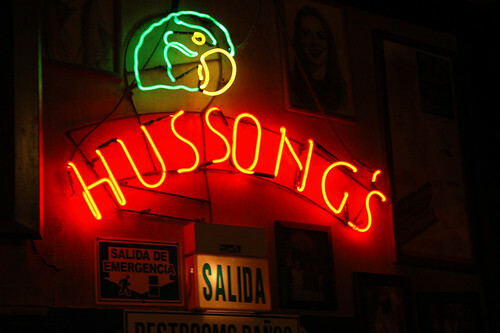 The historic Hussong’s Cantina has been a traditional stop in Ensenada. Mariachis and a shot of Tequila set the mood. 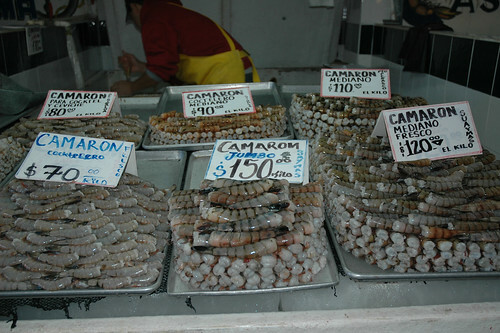 Fresh shrimp, crab, oysters, clams, octopus, squid, and a dozen types of fish line the Ensenada’s open fish market. 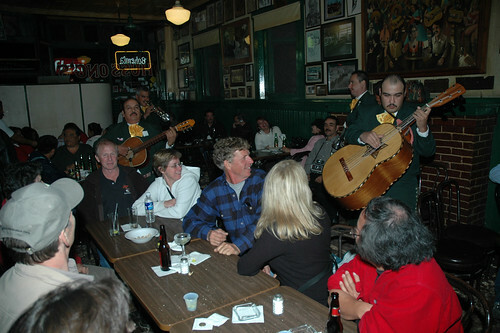 Some live mariachi music and a cold beer or shot of tequila in the historic Hussong’s Cantina is the best way to start any Baja adventure, it’s a tradition. 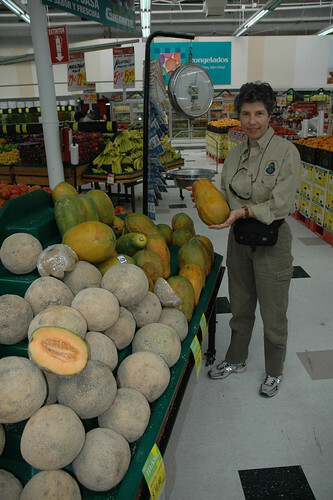 Before we leave Ensenada, we always stock up on Mexican papaya. Fresh fish is on the menu for dinner. 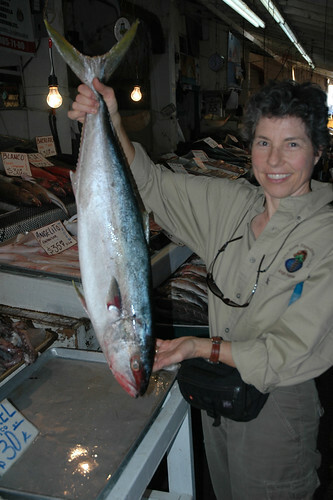 Monika holds up our choice before we have it cleaned and filleted. 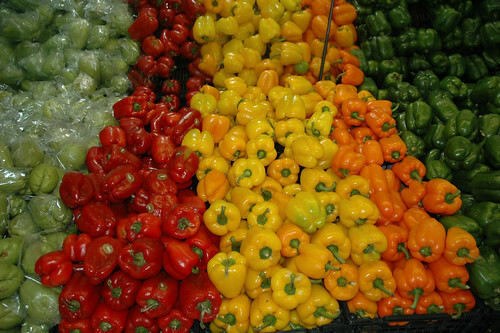 Displays at the local supermarket are always a feast to the eye. To the west, south of Ensenada, the rugged Pacific coastline is largely undeveloped until you reach the southern tip where tourist Meccas like Cabo San Lucas and San José del Cabo poke their high-rise condos into the sky. Until recent years, the road system was so atrocious, all but the most adventurous four wheelers shied away. Passes like the Three Sisters and La Cuesta de la Ley guarded the entry, becoming part of Baja’s legend and mystique. 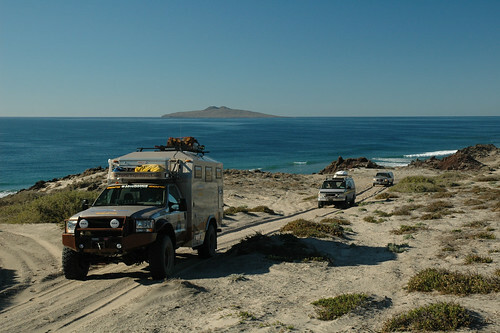 For many, Baja is unnecessarily intimidating. Certainly, like a sharp knife, it demands respect, but with reasonable care and preparation, there is little to fear and the rewards are many. 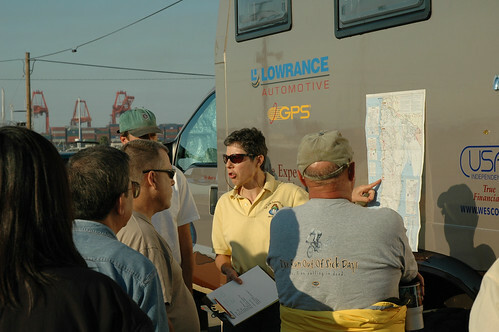 Our group meets each morning to go over our route and discuss possible problems and answer questions. 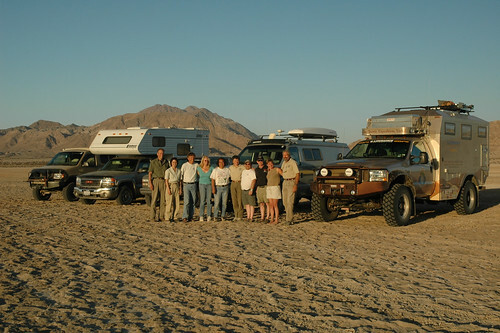 A few years ago, The Turtle Expedition began leading small groups of like-minded adventurers in properly prepared vehicles on trips to some of our favorite Baja haunts. “Properly Prepared” means good tires, suspension, and generally in top mechanical shape. It also means carrying a good spare tire, plenty of water & fuel, a few tools, and emergency supplies for the trip. 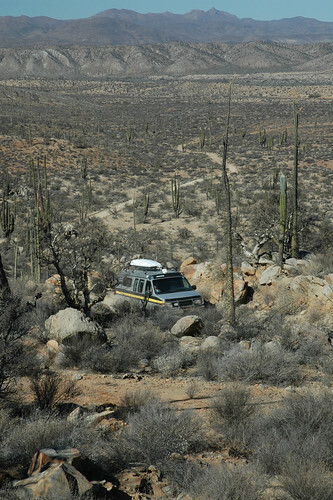 The remote deserts of Baja can be deadly for the unprepared. Four-wheel drive can certainly be helpful if not mandatory. 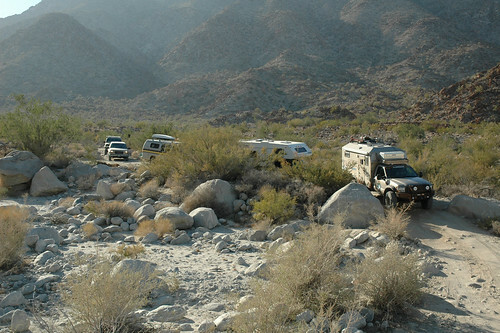 In Baja, “off-road” is an interpretive illusion. We follow roads. Roads go places. The moment you think you’re “four-wheeling” in Baja, chances are good that a Mexican fisherman will pass you with his family in an old two-wheel drive truck with bald tires. 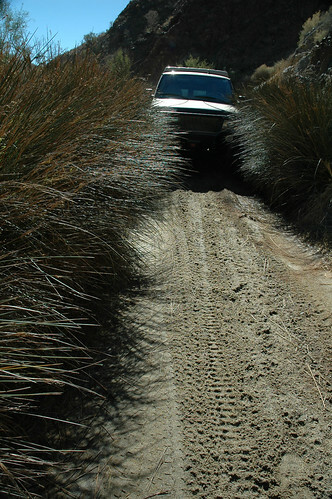 Yes, there are little used roads in Baja that require high clearance four-wheel drive, and those are the ones we favor. 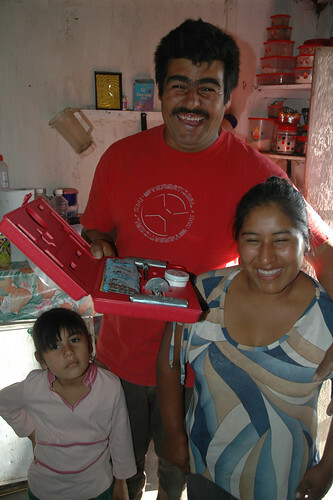 The owner of the little souvenir shop near El Marmol is always happy to see us. 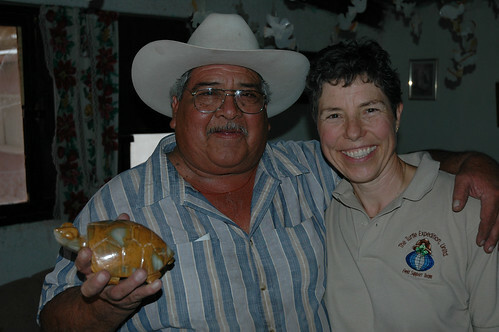 On this trip, he presented Monika with a hand carved turtle. Our small group met in San Diego. After vehicle checks and making sure everyone had the mandatory liability insurance required in Mexico, we headed south, crossing the border in Tijuana. From there it was four-lane toll-road to the port city of Ensenada. We like to take care of business first, so we stopped at one of the modern super markets to buy supplies and change money. Being on friendly terms with the guard at one of the larger hotels in town, we always have a safe place to park inside a fenced compound while we do the tourist stuff. Our next stop was the open-air fish market where everyone found plenty of fresh seafood for the days ahead. After depositing our fish in our refrigerators or ice chests and grabbing a few tasty fish tacos at one of many street stands, (one of the safest places to eat in Mexico), we all headed over to historic Hussong’s Cantina for the traditional beer or a tequila shooter and some live Mariachi music. There was plenty of time to shop for souvenirs along the main boulevard. There are a number of RV parks near town, but the empty lot on the bay next to Los Velos Hotel was safe and quiet,—and free. There are advantages of traveling in a self-contained camper. In thirty years, we’ve never had so much as a valve cap stolen. The sandy two-track leading out to the outer peninsula on the Pacific can be soft, requiring four wheel drive and lower tire pressures. The long flat beach is home to the fat Pismo clams. We let the local fishermen gather them. This is their living. In the morning, we headed south on MEX. 15, winding our way out of the sprawling slums and over the first range of mountains to the Santo Tomás Valley where some of the best Mexican wines are produced. We stopped for fuel frequently, not knowing if the next station may be out, but Pemex has up-graded all their locations, and most now have modern pumps and sorta clean restrooms. We advised people not to expect toilet paper or hand towels. Turning west in San Quintin, we aired down our tires and drove the dusty washboard to the oyster farm on the inner bay where the ladies counting and sorting these delicious delicacies were happy to sell us fresh ones, right out of the unpolluted water, about $3 a dozen. 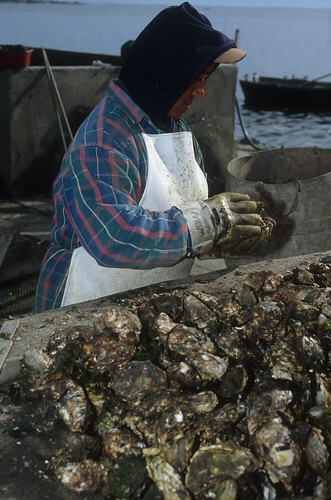 Women at the oyster camp near San Quintin sort and clean the daily crop, our dinner in the making. 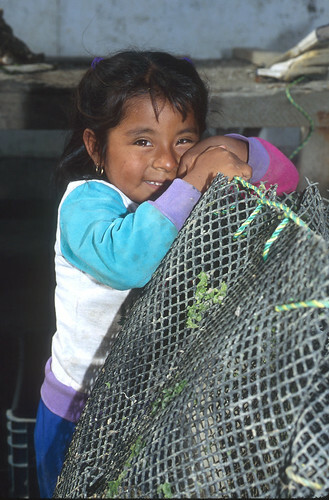 The children at the fish camps are poor, but the few toys we bring down always bring a smile. 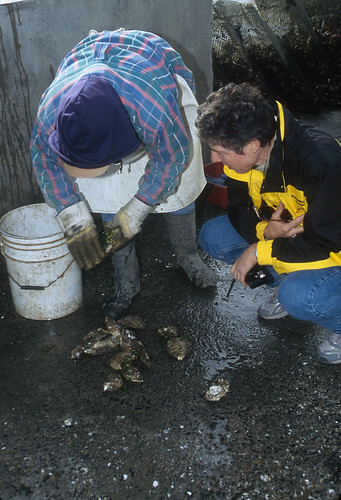 Monika counts our stash of fresh oysters. They always throw in a few extras just to be nice. Winding our way over sand dunes and old lava flows to the outer Pacific peninsula, we arrived at the long flat beach where the big Pismo clams are harvested. Before cruising the trackless sand, we placed our order with a family, and two of the boys came back in an hour with a couple of sacks full. With the dinner menu set, —fresh clams and oysters—, it was cocktail hour. Everyone learned how to open a green coconut, drink a little of the water inside, and refill with a bit of rum. We call them “coco locos”. 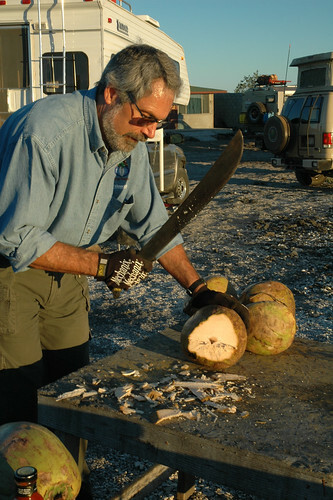 Gary gives demonstration of how to open a green coconut. 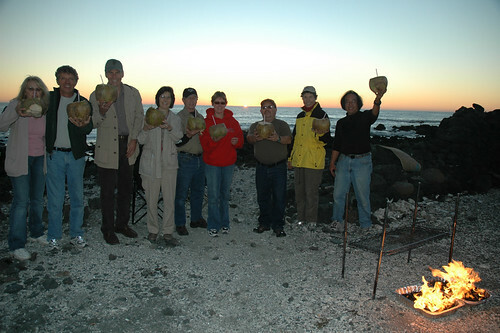 With the fire crackling, we all toasted with our coco locos to a great start of the adventure. 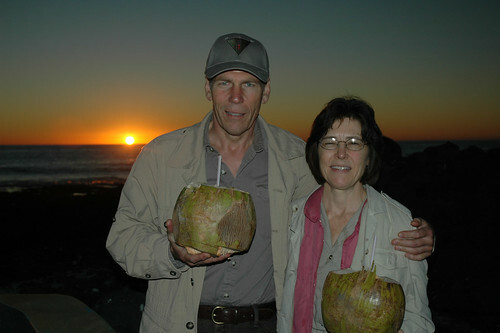 The classic Pacific sunset climaxes just as we prepare our coco locos. As a typical orange sunset exploded over the Pacific, the Coleman lanterns came out and everyone pitched in to prepare fresh oysters. They were excellent baked over the coals, or just raw with a bit of seafood sauce. With the nearest light bulb miles away, it was a quiet night except for the waves crashing on the lava rocks below us. Before we left, we presented Antonio, owner of the little compound where we camp, with a full tire repair kit complements of Extreme Outback Products, www.extremeoutback.com. Fresh clam ceviche, prepared with onions, garlic, tomatoes, cilantro, and chilies, is delicious spread on crisp tostadas. Trusty Coleman lanterns light up the camp. Everyone pitches in to clean our stash of fat Pismo clams. 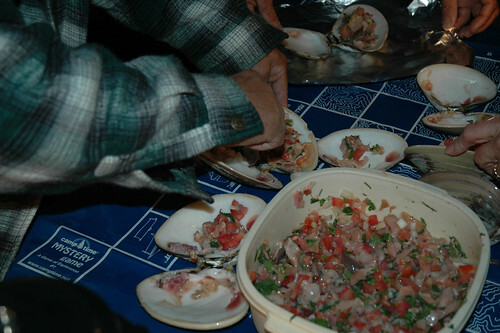 We prepare ceviche and bake them on the hot coals. South of San Quintin, the highway follows the Pacific for a time before turning inland at El Rosario to serpentine down the spine of the Sierra Columbia. The soldiers at the occasional military stops were polite as they do their job, checking for guns, drugs, and the kind of people who traffic such. For our group, they were just added security. Our convoy was spread out over a few miles, but we were all in radio contact should a problem arise. Soon the stands of Cardón and comical Boojum trees started to appear and we monitored our Lowrance GlobalMap GPS. At a premarked way point, we hung a right on a sandy two-track that led to one of our favorite camps, hidden back amongst the giant piles of house-size boulders that had suddenly appeared out of nowhere; Turtle Camp. Chairs and hors d’oeuvre in hand, we hiked up to the top of the highest outcrop to watch a surrealistic sunset over the increasingly lush desert flora. 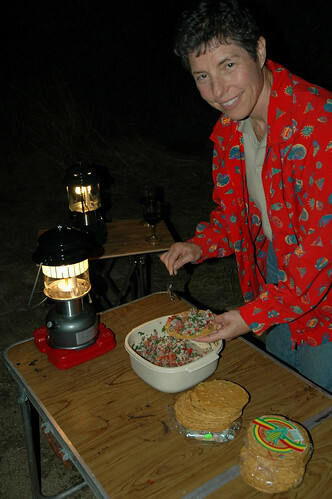 Back in camp, it took no time for a Mesquite fire to produce a bed of glowing coals, and we set about the task of cleaning and preparing the fresh Pismo calms, diced in a ceviche of lime juice, tomatoes, onion, and cilantro; or barbecued to plump perfection. 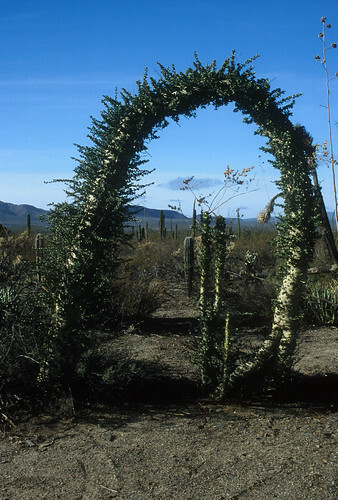 The wildly erratic Boojum trees look like something out of a Dr Seuss book. No two are identical. 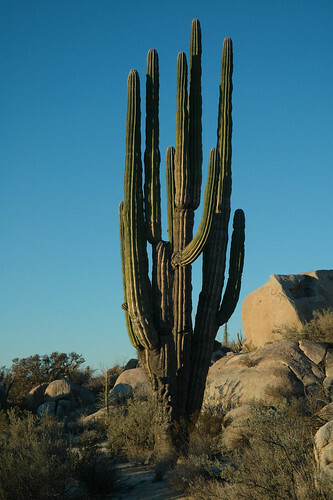 The magnificent giant Cardon cacti of this region stand above the desert like lone sentinels. 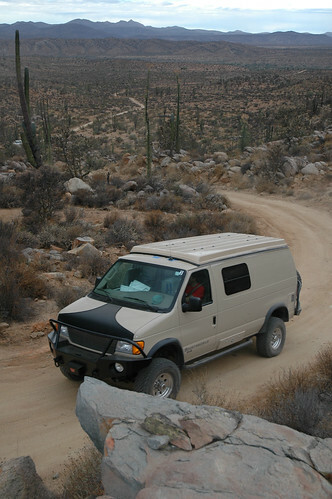 Driving backroads in Baja California is a special treat, but one must go with a properly prepared vehicle. The beautiful Baja backroad we follow from the rock garden to the Pacific gives everyone a feel how diverse this peninsula can be. As a golden sunrise melted over the stands of Cardón and Boojum, defusing through the spines of Cholla and Senita, we turned west toward the distant Pacific. 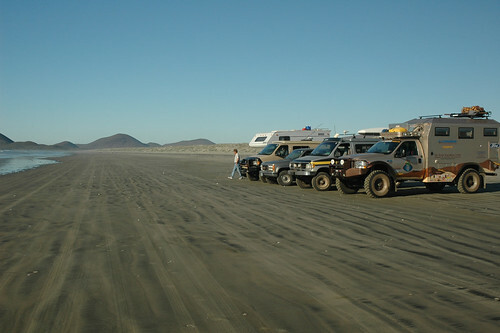 The famous Baja 1000 Off-Road Race frequently uses this track, but it’s also traveled by the occasional fisherman or rancher to access this remote part of the peninsula. Climbing over rocky ridges and crossing sandy washes, each valley seemed to have specialized in a particular plant. 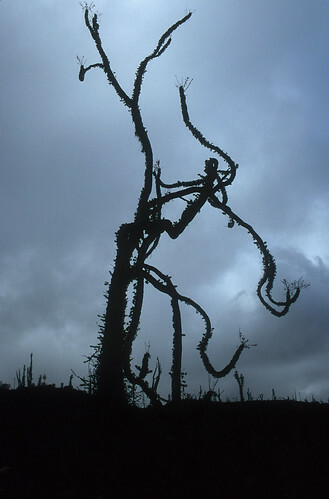 Forests of stately Cardón were replaced by parades of Boojum, contorting themselves into shapes from a Dr. Seuss book. After some fifty miles, we had our first glimpse of the blue Pacific, and soon we were negotiating with our friends at the fish camp for fresh lobster. The waves were a bit too rough to take their small boat out, so we drove around the point to camp on cliffs overlooking the ocean. It was low tide, and the rocks below our camp were covered with fat, clean mussels. We plucked off a bucket full and steamed them with garlic, butter and a little white wine for a gourmet treat. 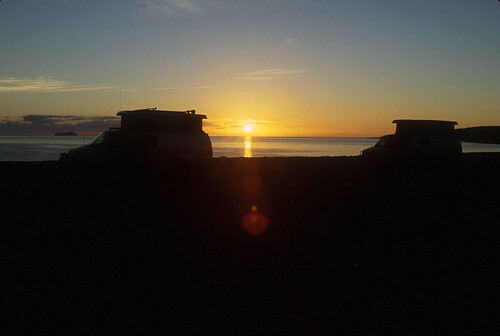 Our camp on the remote Pacific is majestic. This is what backroad adventure is all about. 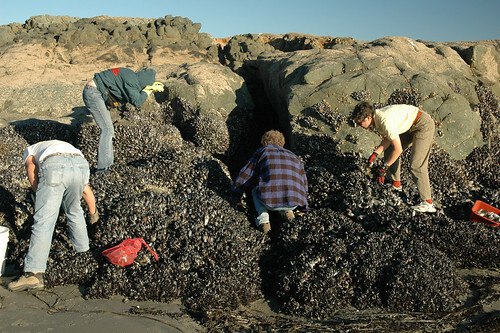 Just in front of our camp on the Pacific, low tide reveals rocks covered with clean, delicious mussels. Steamed with garlic, butter and white wine, they are a treat. 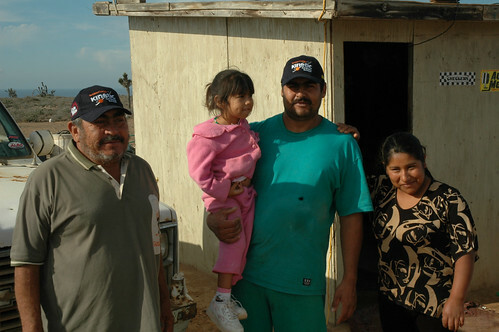 Francisco, his wife Maria and father José live a rugged life at this remote Pacific fish camp. We always bring a few treats for their young daughter Celeste. At dawn, with calmer seas, the fishermen were able to reach their traps. We picked up our pile of “bugs”, some 45 or 50 by rough count, and headed back to Hwy 15, but not before saying good by to Francisco and his wife and little girl, and presenting him with a full tire repair kit from Safety Seal, www.safetyseal.com. 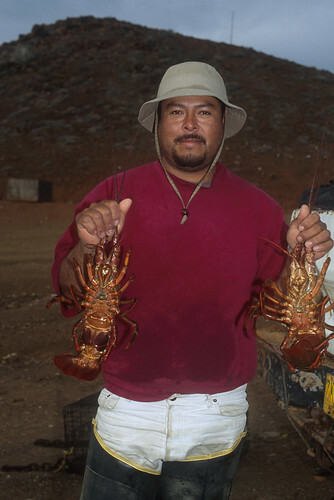 In the morning, with calm seas, the lobster fishermen bring in our stash of bugs from their offshore holding traps. 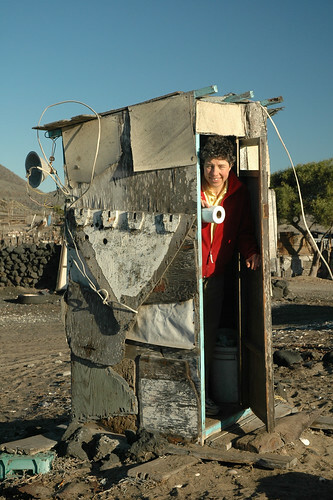 Monika had to check out the outhouse! Reaching the blacktop again, we stopped briefly at the old Rancho Santa Inez to fill up our water tanks from their deep well and air up our tires before continuing south to the unmarked El Crucero turnoff and the abandoned Calamajué Mission trail. This seldom visited National Protected Area, “Valley of the Cirios”, must be one of the most beautiful deserts in the world. Virtually every type of cacti found in Baja grows side by side here. We stopped to walk and explore the plant life up close before making camp in this garden. 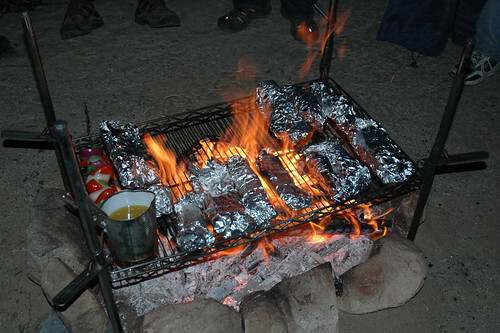 Fresh lobsters were broiled over the coals and baked in foil. A pot of melted butter sat warming next to the fire ring. 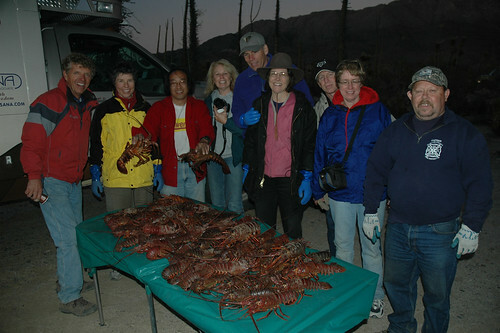 A pre-dinner group shot; 10 hungry people; 50 fresh lobsters! Butter-flied and grilled over the coals or wrapped in foil and baked, it’s hard to beat fresh lobster in the middle of the desert. Lobsters wrapped in foil with butter and spices is a trick we learned from the local fishermen. The can of melted butter is our idea. This was the second time we were using the “Quick! Adjust Grill”, www.quikadjust.com, a neat invention that allows you to raise and lower a big stainless steel grate to any level over the fire with the touch of a finger. Perfect for group or family camping. Its ability to raise and lower as the coals change was a real advantage, especially with a big group. Climbing out of the Calamajué Gorge, the dusty two-track heads for Gonzaga Bay on the beautiful Sea of Cortez. The Mexican Spiny Reeds at the entrance to the Calamajué Gorge is our version of a car wash. 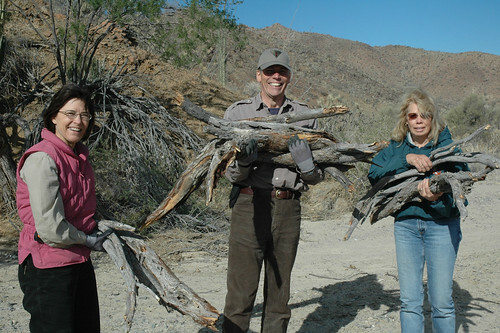 The daily firewood stop is part of the adventure. 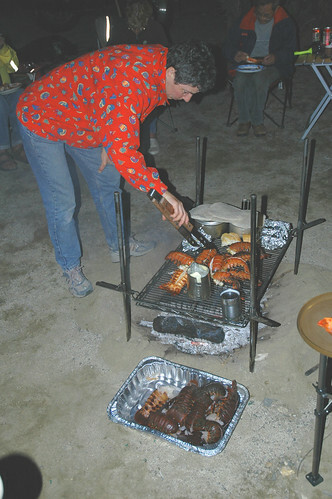 Cooking over a mesquite fire is part of the flavor of fresh seafood. In the morning, the fun began again. Thirty-five years ago this old mission trail was the only way to Gonzaga Bay from the south. There is a new road now just north of the dry Lake Chapala to Coco’s Corner, but the route through the Calamajué Gorge is both beautiful and challenging. This year it too had been used by the Baja 1000 race, so the center berm was higher than usual. Dropping steeply into the canyon between sheer cliffs, we pushed through the Mexican Spiny Rush, in places only a couple of feet wide where the streambed is the road. It was sort of like one of those automatic car washes. The mineral deposits left by the trickling spring near the site of the abandoned Calamajué mission has built up for thousands of years. A little rain can make some sections in the Calamajué Gorge exciting. Coming through two weeks after the Baja 1000 race can mean some nasty holes. Very little is left of the old Calamajué mission site. A few rock walls from outbuildings are fun to explore. As usual, there were some Mesquite limbs that threatened to remove paint from The Turtle V, but a pair of loppers cleared the way. 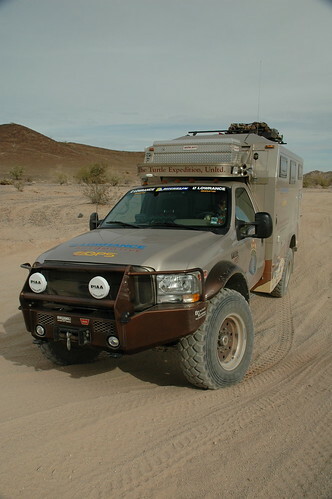 3M Clear Protective Film on the Tortuga Expedition Vehicle’s Seitz dual-pane windows prevented unnecessary scratches. The soft sand in the flood channel sometimes asks for four-wheel drive, but a recent rain had firmed it up a bit. We always stop at Coco’s Corner. The old character has created a legend in his own time. We stopped at the Calamajué spring to see how it was flowing, and further down the canyon, we parked for a short walk up to the old mission site. Adobe foundations and a few rock walls are all that is left. A steep rocky climb took us back to the desert where we bounced across Valle Calamajué through numerous arroyos to the new graded road to Coco’s Corner and the Bahía Calamajué fish camp. Coco is a character by any definition. This one-legged guy lives alone in the middle of the desert, and he’s been there long enough to be noted on some maps. We stopped to admire his eclectic collection of treasures, grab a cold beer or Coke, and sign his guest book. Sunrises over the Sea of Cortez are always a treat. We have never been disappointed. From Coco’s, it was a short drive to Alfonsina’s on picturesque Bahia San Luis Gonzaga. Those who needed fuel could top up while others took hot showers. The Turtle V’s 72-gallon system has about an 800-mile range, plus what we carry in Jerri cans, so we relaxed on the veranda of this old fly-in fishing resort and watched the gray pelicans skim the glassy water behind one of the nicest beaches on the Sea of Cortez. After a pleasant camp in a private cove a few miles north, we tackled the rough washboard over the infamous Three Sisters, frequently called the Three Whores before the road was improved and graded. The sleepy town of Puertecitos had little to offer, but the newly paved road north to San Felipe was a relief from what used to be a chain of endless toilet-bowl potholes. By popular vote, we stayed at a comfortable RV park in San Felipe, and took time to wander the tourist stalls in search of a souvenir and the perfect taco. 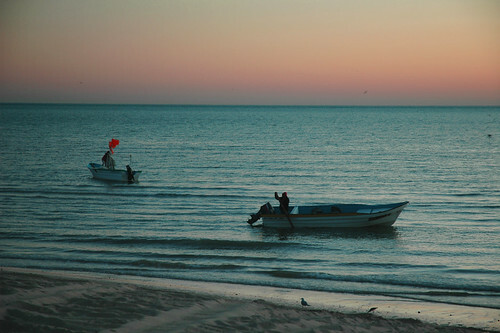 Camped on the beach in San Felipe, the morning sun creeps over the horizon while fishermen launch their boats. The narrow rocky trail into the Guadalupe Canyon Hot Springs demands careful driving and high clearance. 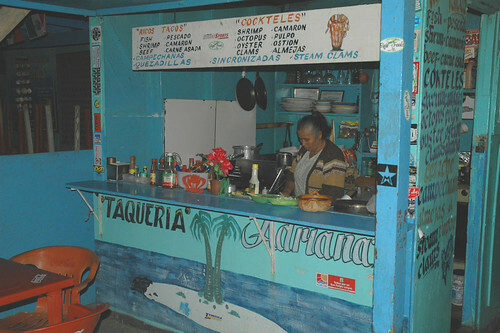 The taco stands in San Felipe are a great place for a late night snack or a full dinner. During December, you can find a special treat: homemade tamales! Rugged suspension and reasonable wheel travel are requirements for any backroad expedition vehicle. 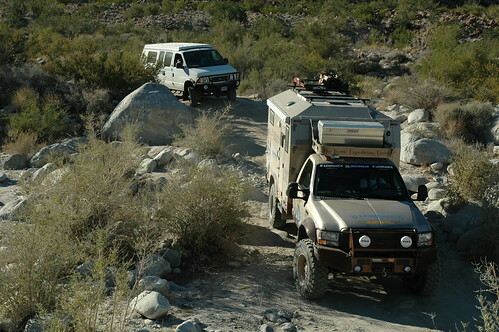 The rocky trail into the Guadalupe Canyon Hot Springs requires high-clearance vehicles and good suspension. Getting an early start, we drove north on MEX. 5 and at a point our GPS indicated, we turned onto a dirt track across the southern end of the normally dry Laguna Salada. We followed a hard-packed two-track barely wide enough for our tires. Thanks to a recent rain, there was treacherously soft mud on either side. 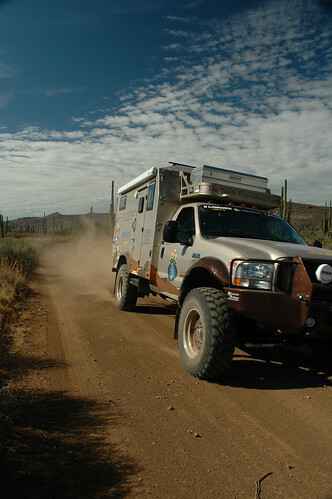 At length we reached dry desert, and picked up another stretch used by the Baja 1000. The silt holes and whoopdeedoos demanded careful driving, but thanks to diligent GPS logs from the previous year, we mostly knew where we were going. 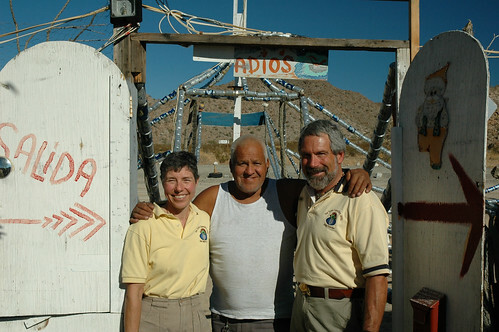 At last, just as evening shadows started to grow, we arrived at our final camp, the Guadalupe Canyon Hot Springs. Each camp has its own private hot tub built into the huge granite boulders. A fire was built, portable barbecues were unpacked, and a farewell party was soon underway. 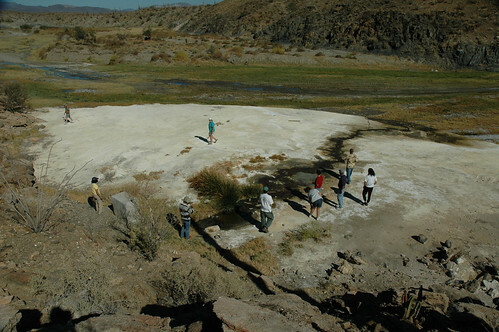 Hiking above the Guadalupe Hot Springs we can clearly see the dry lake bed and the range near the Sea of Cortez. 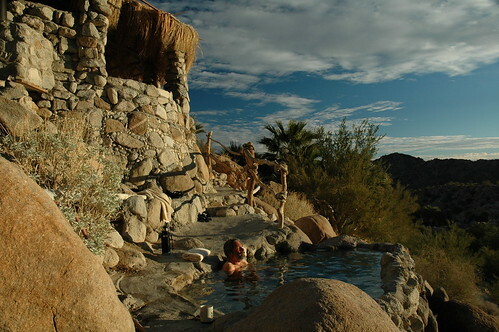 After a tiring day of Baja back-roads, the cool evening is the perfect time for a warm soak at the Guadalupe Hot Springs. Each campsite has a private pool..
A cup of hot coffee nearby, we soak in the warm hot spring tubs in Guadalupe Canyon. This is the way to wake up every morning! Some fifty miles from the nearest light bulb, the stars were spectacular. As the coals turned to embers, we slipped into our tubs for a final soak. Sad to say, as we write this account, the beautiful palms and palapas at the springs were destroyed by fire, and it will take years to recover. 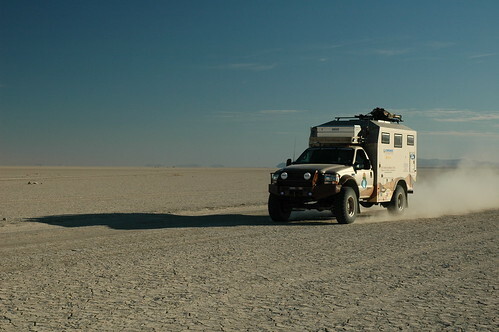 When Laguna Salada is dry, we can speed across at 60 miles an hour, being careful to watch for soft spots. 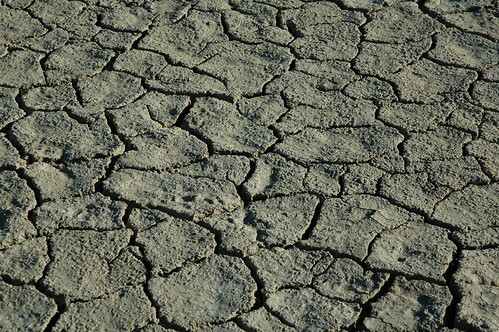 The dry crust of Laguna Salada can hide gooey black mud just inches below the surface. 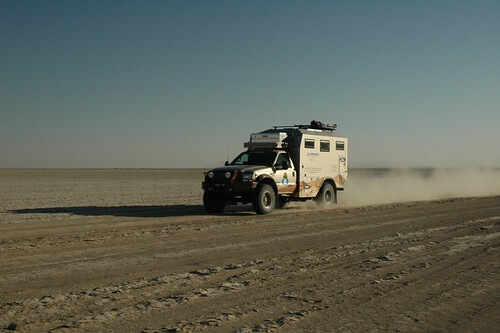 Heading out in the morning, the lake bed was still dry, so we could take the smoother and faster way back to the highway, speeding across the smooth, hard-packed mud flats at speeds over 65 mph. Reaching the super highway from Mexicali to Tijuana, we aired up a final time, checked our suspension, and two hours later we were crossing the easy border in Tecate, just south of San Diego. It had been another great adventure. The traditional group shot is a time to air up tires and say goodbye to new friends at the end of a great adventure.